Scott grew up in the town of Sebastopol, California, a west Sonoma County town surrounded by vineyards and orchards. He was raised on equally healthy doses of the outdoors through skiing, backpacking, and music though countless concerts in the Bay Area. He attended San Francisco State University with the intention of pursuing a degree in music only to discover an Environmental Studies program which caught his attention. After graduating with a BA in Sustainability and Social Justice, the mountains of the Eastern Sierra Nevada drew him away from an urban life. 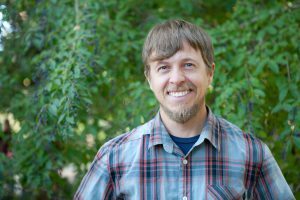 Starting with a Student Conservation Association internship with the Inyo National Forest in Bishop, Scott embarked on eight seasons of trail work and wilderness stewardship. From dry-stacked granite walls on the Mount Whitney trail to 40-inch trees and a cross cut saw to waist-deep snow in the Mammoth back country, his time on the Inyo solidified his relationship with the natural environment and encouraged his desire to protect and enjoy natural spaces. Coming to The Land Conservancy allows Scott to continue working within California’s beautiful landscape. In addition to living in Morro Bay with his girlfriend Hilary, Scott enjoys mountain and road biking, surfing, running, backcountry skiing, world travel, and cooking with as many local veggies as possible.